igus' new Tribo-filament uses the same proven technology as igus' iglide bearings. Tested countless times in our in-house lab, this is the first 3D-printer filament specifically developed for dynamic applications. 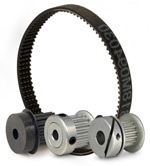 Create custom, wear-resistant bearings, prototypes, or other components with excellent strength and wear-resistance. Two materials available to sample and well as full spools. Inflatable ground satellite antennas are aiding the expeditionary nature of U.S. and coalition forces, enabling them to achieve high-bandwidth network connectivity anywhere in the world from small deployable packages. Fitting in just two transit cases, the GATR antenna provides the same robust data links as conventional, rigid satellite dishes but weighs up to 80 percent less. 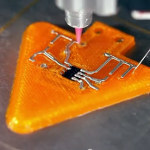 Stratasys is collaborating with design and product development company Worrell to accelerate medical device development through the use of 3D-printed injection molding (which Worrell refers to as "3D IM"). Since 3D printing injection mold tools for medical devices, the company is producing injection-molded prototypes using final production materials in 95% less time and at 70% less cost compared with traditional aluminum molds. Stanford engineers have invented a revolutionary coating material that can help cool buildings, even on sunny days, by radiating heat away from the structures and sending it directly into space. The heart of the invention is an ultrathin, multilayered material that deals with light, both invisible and visible, in a new way. International automotive supplier Continental has been developing and manufacturing anti-lock systems for motorcycles for more than 10 years. The German company has now enhanced its Motorcycle Integral Brake (MIB) system by adding a new function: optimized braking for curves. Up until now, Anti-lock Brake Systems (ABS) for motorcycles have been designed to maintain stability during straight-line braking only. Improve the performance of your hydraulics-driven industrial systems with expert hydraulics technology advice and useful engineering tips in the Hydraulics Performance Kit from Bosch Rexroth. 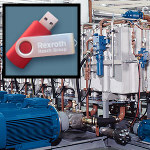 Packaged in a convenient 1-GB USB drive, the kit includes a specially selected array of technical papers, helpful videos, and special links to Rexroth hydraulics product information. Whether you are an OEM, systems integrator, or end-user manufacturer, the Hydraulics Performance Kit is tailor made to support your efforts to improve the performance of your hydraulics-driven industrial systems. Get your Hydraulics Performance Kit. ON Semiconductor has introduced a family of affordable, precision CMOS operational amplifiers (op amps) that deliver zero drift operation and industry-leading quiescent current for front-end amplifier circuits and power management designs. Targeted at industrial, white goods, telecom, wearables, Internet-of-Things (IoT), test equipment, and instrumentation applications, the NCS325 and NCS333 op amp devices enhance the accuracy of motor control feedback and power supply control loops, contributing to higher overall system efficiency. These devices are complemented by the new NCV333 automotive-qualified (AEC-Q100 grade 1) op amp offering similar functional performance for powertrain, braking, electronic power steering, valve controls, fuel pump, and fuel-injection system applications. A new high-performance tape from 3M attaches to an increased variety of surfaces without pre-treatment. The 3M Acrylic Tape Series PX5000 is used to attach automotive exterior trim parts such as body side moldings and claddings to a variety of materials and substrates. 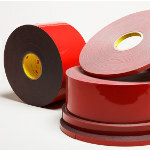 This tape series offers several key benefits, including excellent high-temp adhesion power to Low Surface Energy (LSE) and Medium Surface Energy (MSE) plastics -- including thermoplastic olefin (TPO), polypropylene plastic (PP), and PP/ethylene propylene diene monomer (EPDM) rubber -- as well as to medium-to-difficult automotive clear-coat systems, without the need for an adhesion promoter or other surface pre-treatment methods. SOLIDWORKS 2015 helps speed up your production, integrate design processes with downstream manufacturing, lower costs, and accelerate time-to-market. Learn how users can take advantage of enhanced cost analysis for better upfront estimates, integrated inspection to simplify documentation and quality control, communicating product and manufacturing information (PMI) directly in 3D, and using special electrical tools to enhance embedded electrical design. If you aim to trim waste from your designs, SolidWorks 2015 has you covered from every angle.